The glory of Portugal is undoubtedly its world famous fortified wines, principally Port itself and Madeira, made on Portugal’s Atlantic island outpost. But an interesting and ever-developing still wine scene is well worth keeping an eye on. Occupying a long narrow strip down the western seaboard of the Iberian Peninsula, the dominant factor on grape growing in Portugal is the Atlantic ocean. In all but the deep south of the country coastal conditions are wet and cool. Grapes grown here are fairly difficult to ripen and light, high-acid wines like Vinho Verde are made. Further inland the climate is considerably warmer and sunnier, rainfall is lighter and the vineyards are more sheltered. The Northeastern quarter of the country is home to great wine regions like the Douro which grows the grapes not only for Port, but for an increasingly good range of red wines. Rather like the Northern Rhône, the upper reach of the Douro Valley is a steeply sloping, cavernous landscape, where terraces have to be blasted into granite and schistous rock for the vines to gain a foothold. The weather here can be extreme, the mountains of the Serra de Marão causing long, dry summer months.The Southern tip of Portugal is just too hot and dry for grape growing, though the large Alentejo region is a very significant producer of modern wines. On the island of Madeira conditions are moderated by a mountainous slopes and coastal conditions (note: Madeira is several hundred miles southwest of Lisbon: the map above is not to scale). There is a very large range of indigenous Portuguese grape varieties, which for me is one of the potential strengths of the wine-making scene: not too much incursion as yet by the ubiquitous international” varieties. One of the most important grapes is the Touriga Nacional, the mainstay of Port (though Port is a blend of up to 18 different varieties) and the best wines of Dão and the Douro. The Periquita and Baga are other quality grapes. For centuries the Portuguese were a great seafaring nation. Consequently, Portuguese wines were exported widely. Purely to enable the wines to survive the long, hot sea voyages, red wines were fortified by the addition of spirits. This was the beginning of one of the world’s great wines and wine-making techniques. The grapes for Port are grown on the steep, baking slopes of the upper Douro Valley close to the Spanish border. Traditionally, the grapes were harvested and transported down the Douro river to the city of Oporto on sailing boats knows as Barcos. Oporto is still the centre for the maturing of Port wines, as well as the commercial trading and export centre. All of the great Port houses have headquarters in Oporto and its twin town of Gaia, many of them English in origin. This stems from an 18th Century trading agreement known as the Methuen Treaty. Some particularly good years are worthy of declaring as vintage years, though not all wineries declare their wine as a vintage in any given year. Indeed, in most years no vintage Port is made. Vintage Ports are made to be aged – spending 2 years in oak before bottling, and generally not showing their best for another 15 years or more. Some will improve for much, longer. These expensive wines are the aristocrats of the Port world. The second string. These also come from one vintage year, but usually one that’s not quite good enough to be declared. Grapes come from a single vineyard, whereas Vintage Ports are blends from the best sites. These are not true Vintage Ports. Wines may be blended from various years and then aged for a long time – up to 10 years – in oak. This is supposed to give them a similar character to a well-aged Vintage. Not all succeed, but some can be very good. Sweetish “full-bodied” wine that has probably been aged in wood for a short time. Can be a bit harsh. The difference between this and ruby Port is simply the amount of time the wine has spent maturing in oak. Top tawny Ports from the best producers can be almost as complex and fine as vintage Port – these will specifically say “10 year old” or “20 year old” on the label and may cost between £10 and £30. Cheap tawny Port is a blend of ruby and white – and is generally not up to much. These are rather like tawnies, but are Ports of a single year, given long, long ageing in wood. Usually drunk as an aperitif. Not very common in the UK, though popular in Portugal and France. From the island of the same name, Madeira is made by the Port method. One important difference is that the newly-fermented wine is deliberately over-heated to give Madeira its typical caramelised tang. Madeira can range in style from fully sweet to fully dry. There is a lot of cheap Madeira about, made from the Tinta Negra Mole grape, but the best wines are made from one of the 4 noble grapes listed earlier (the grape will appear on the label).Madeira is made at Reserve, Special Reserve and Exceptional Reserve levels (aged 5, 10 and 15 years in oak respectively). Vintage Madeira is also made in special years, exactly like Port. Portugal is definitely a place to keep an eye open for in the coming years. Many of the red wines deliver terrific quality at their reasonable prices, and are usually well worth a try. Alentejo and Ribatejo in the sunny Southeast are progressive areas producing flavoursome wines from the soft and quaffable to serious barrel-aged examples. Red and white are worth trying. Bairrada makes reds brimming with raspberry and blackberry fruit and high in tannins. Dão is starting to make some very exciting wines from elevated vineyards, red and some white. 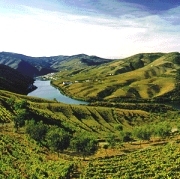 The wines of the Douro were unknown outside of Portugal until quite recently. The area was famous as the vineyard area for Port, but not for table wine. Recently more and more high quality fruity red is appearing from the region that has some of the tannic backbone of Port. Aromatic whites are also produced in what is arguably now Portugal’s premium table wine region too. As has been stated above, the strength of Portugal is in its use of local, traditional grapes. Therefore, the table wines of Portugal in particular have had little direct effect on the rest of the world. What has undoubtedly had an impact, are the fortified wines of Port and Madeira. Many producers in California make fortified wines (Quady wineries, one of the biggest, calls one of theirs “Starboard”!). Australian Port (still called that in the local market) is of very high quality indeed and is one of their most traditional wines. In South Africa, fortified Muscadelle wines are very popular, made exactly like Port and matured in oak casks.